There’s nothing like a steaming hot cup of tea to help put your mind at ease or soothe a sore throat. Turns out that many of those very same medicinal properties that quell stress also can improve your skin — in fact, that a growing number of beauty brands are adding tea extracts to their formulations. However, as with most food, the best way to reap the benefits is by direct consumption. So boost your skincare routine by adding some of these teas, all of which have major beauty benefits, into your diet. “I love herbal teas like chamomile because they have wonderful relaxants that can be safely used every night to help you sink into sleep,” says Dr. Tieraona Low Dog, MD, the chief medical officer of Well&Being (a wellness concept available at luxury hotels across the country). If you wake up and can’t go back to sleep, she suggests bringing one cup of milk (your choice) to near boil and pouring it over one teabag of chamomile. Steep for 5 minutes. Take out the teabag and add one teaspoon honey. “Sip it warm while you sit in a comfy chair in low lighting. Read a book or do ten minutes of meditation. After about 20 minutes, head back to bed. Chamomile in warm milk is a fantastic middle-of-the-night relaxant.” Remember, relaxation is essential for warding off dark circles and helping skin heal naturally. To combat dehydrated skin, Dr. Tieraona Low Dog recommends filling a water bottle with room-temperature water and adding a peppermint teabag. “It imparts a lovely mint flavor to the water, giving you added motivation to continue hydrating throughout the day.” Peppermint tea may also help treat skin irritation and allergies because of its cooling property (you can add it to your bathing water to help treat your skin topically as well). Also note that peppermint tea is particularly helpful for anyone with oily skin as it contains menthol, which helps reduce the secretion of oil by the sebaceous glands. Black tea is made from cured tea leaves, and unlike the high levels of caffeine found in coffee, the amounts in black tea promote blood flow to the brain without over-stimulating the heart. “The caffeine in black tea sharpens mental focus and concentration, while also having a soothing and anti-inflammatory effect,” says May Tom, MPH, RDN at Cal-a-Vie Health Spa in California. This anti-inflammatory effect not only works wonders for your digestive tract, but to help soothe irritated skin. Green tea, made from steamed tea leaves, is particularly rich in health-promoting flavonoids, including catechins and their derivatives. “Catechins have been found to be more potent free-radical scavengers than the well-known antioxidants Vitamin E and C,” says Tom. “The most abundant catechin in green tea is epigallocatechin-3-gallate (EGCG), which is thought to play a pivotal role in green tea’s anticancer and antioxidant effects.” Another great thing about EGCG? The antioxidant is thought to help reactivate dying skin cells, meaning sipping green tea is a fantastic complexion booster. White tea is made from uncured tea leaves. “Leaving tea leaves so close to their natural state means that white tea contains more polyphenols, the powerful antioxidant that helps the body fight and kill cancer cells, than any other type of tea,” says Tom. This also means it’s one of the most effective at boosting skin luminosity. It’s also been shown to help fight infection causing bacteria, which is why it’s often suggested for people who suffer from skin irritation and breakouts. Native to China, yellow tea is still relatively under-the-radar, but given its fruity-sweet taste that’s bound to change. It has almost as many antioxidants as green tea which along with its trace minerals and vitamins (including B2, B12, and E) work to help fight signs of aging and boost skin luminosity. One thing to remember about tea is that no matter which you opt for, they’re all detoxifying to some extent, which in turn will help stimulate your metabolism, boost relaxation, improve sleep quality and, as a result, improve skin quality and outward signs of revitalization. Although oolong only has a moderate amounts of catechins (because it’s semi-oxidized, which removes some of them; by comparison, black tea is fully oxidized and green tea is un-oxidized), oolong tea is high in antioxidants called polyphenols which help improve oral health and hygiene by inhibiting the growth of the bacteria that causes tooth decay. Ginger works wonders; so much so that many health experts consume it on a daily basis. In addition to helping boost circulation (one of the reasons it’s particularly popular come winter), studies have shown that it can help lower the bad LDL cholesterol and because of its high level of anti-inflammatory compounds, it helps flush out toxins thereby boosting skin luminosity and moisture. You can apply all the moisturizing lotions and creams you want, but for your true beauty to shine, it’s imperative to hydrate your skin from within. Ginseng has long been considered anti-aging because of its high levels of phytonutrients, which work to tone and brighten skin. Bonus: Ginseng is one of the Best Foods for a Hangover Cure! If you tend to get sick a lot drinking echinacea tea on a daily basis may be something you want to consider as it’s best known for giving the immune system a boost. It has also been shown to help improve skin conditions like eczema, irritations, and various inflammations (apply it topically, in addition to drinking it, for an even more potent effect) because of its antibacterial and antiviral properties. Constipation not only affects how you feel, but a clogged system can show up on your face. Rosehip tea may be a great solution. This tea is made by pouring a cup of boiling water over a tablespoon of crushed, dried rosehips and letting them steep. The tea is said to have a mild laxative effect, so it may help relieve constipation and, as a result, help clear up your complexion. Jasmine tea acts as an anti-inflammatory, which can help treat irritated skin. It’s also been found to help ease chronic inflammation. Note that when it comes to tea extracts in beauty products, jasmine tea extract is one of the most popular ones. Jasmine tea can be based on white, green, black, or oolong tea; the base is then flavored with jasmine flowers. The hibiscus flower is not only beautiful, it can be potent when consumed as tea because of its anti-inflammatory and antioxidant properties. 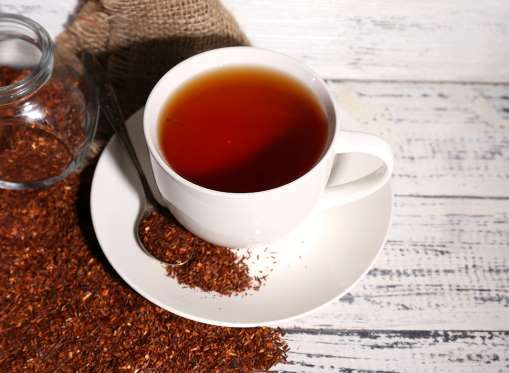 These properties result from the vitamins it contains (namely C and A, but this tea also contains B1, B2, zinc, and iron), which can help treat acne, burns, skin allergies, and boost skin elasticity. Little wonder, then, that hibiscus has long been a staple in herbal tea blends. “The Reishi mushroom has a reputation for its powerful anti-aging properties and is often known as the ‘mushroom of immortality,’” says Richens. So reach for teas with reishi to get an antioxidant boost that’ll help skin stay young and healthy. In addition to adding dandelions to your salads, supplement your tea with them. Their immune-enhancing antioxidants work to brighten skin and improve digestion (which, in turn, will help keep skin clear). You probably know about the benefits of green tea, but one type in particular—matcha, a powder—is especially potent. In fact, one-quarter to one-half a teaspoon of matcha is equal to 8 to 10 cups of regular tea in terms of antioxidant power. This not only contributes to matcha’s cancer- and disease-fighting properties, it also makes a great bacteria fighter, thereby promoting an even, clear complexion. Kombucha tea may be trendy, but there’s good reason for it. This particular tea is made from fermented black tea and can help detoxify the skin because of its abundance of antioxidants and probiotics (kombucha itself is a type of yeast).